Complete title: A "5" Could Make Me Lose Control! : An Activity-Based Method for Evaluating and Supporting Highly Anxious Students. Designed to be used to assess and treat anxiety in individuals with autism spectrum disorders (ASD). Individuals who cannot verbalize what is causing their melt downs can use the cards to identify situations that make them feel uncomfortable. 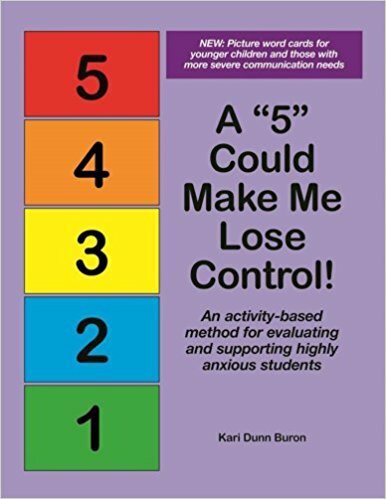 Uses the 5-point scale, an intervention used as a way of breaking down social and emotional concepts into five parts and using a number system rather than spoken words, making the process less stressful and less confrontational. Author has used this activity with students ages 4 to 18. Task is to be completed with an adult. Contents: booklet written by Kari Dunn Buron, sorting folder, and activity cards. Two-week loan period.